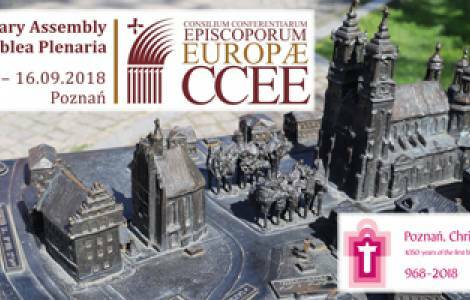 Poznań (Agenzia Fides) - The spirit of solidarity in Europe is the theme of the annual Plenary Assembly of the Council of European Episcopal Conferences (CCEE) to be held in Poznań, Poland, from 13 to 16 September. According to the communication sent to Fides, Father Wojciech Sadłon, member of the Institute of Statistics of the Catholic Church in Poland, will open the works of the first session, with the subject: "Europe: solidarity in the shaping of consciences and society", and will present a summary of the investigation on volunteering, promoted by CCEE and carried out in these months through Bishops’ Conferences. The second day will see the Bishops examine in depth the state of solidarity in Europe and the Church’s mission, examining the relationship between the Bishops’ Conferences and the States. Finally, the meeting also envisages a presentation about the work and priorities of the Dicastery for Promoting Integral Human Development from the Secretary himself of the Vatican body, Mgr Bruno Marie Duffé. The Assembly will end on Sunday 16 September with the celebration of Mass in the Cathedral of Saints Peter and Paul in Poznań, with the local community. The ecclesial meeting is taking place in the homeland of the Polish Pope Saint John Paul II, to celebrate the 100th anniversary of the recovery of Poland’s independence and to celebrate the 1050th anniversary of the first bishopric in the Country.